Both my first novel, When We Were Strangers, and my current one (coming in September, 2013), put the main character for some time in boarding houses in the years between 1880 and 1911. So I did some research and find these fascinating institutions that served many purposes. Young men and women were coming from farms and rural areas to the big American cities. Private housing was expensive and solitary in a new and overwhelming places. Boarding houses received them and provided an instant family. Immigrants found small enclaves often of their own nationality, something like the villages they’d left. Young working women could live respectably, often with some oversight by the landlady and companionship of other boarders. There were houses that catered to men, to women, to ethnic groups, to those who kept kosher and to members of various trades. They came in all price ranges. Keeping a boarding house gave respectable work to widows who might not otherwise have been able to maintain themselves or keep a home they’d managed with a husband’s income. There was a necessary regimentation: meals were served at fixed hours. Too bad for latecomers. Bathrooms were shared. Rent must be paid. There was little privacy. But around the big table and in the parlor at night, the city worker found company and a semblance of home. In the 19th C, the words “family” and “household” were often used interchangeably. In a fluid time, the boarding houses offered home to the rootless, the newly arrived, the seekers, the ambitious, and those in transit to new lives in new worlds. 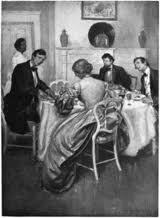 Note: The dark-haired man in the illustration is Abraham Lincoln who lived in boardinghouses in Springfield, Ill. before he married Mary Todd.